Before a postwar population boom triggered an almost wholesale conversation of farmland to suburbia, much of Orange County appeared decidedly rural. 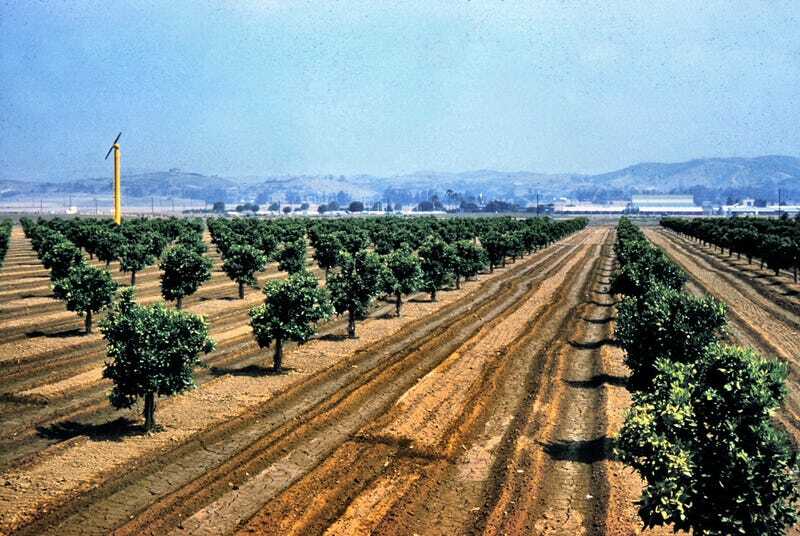 In 1948, a vast forest of five million Valencia orange trees grew on 67,000 acres2—but the county's sprawling ranches supported more than just citriculture. Dairy farms dominated the Orange County's northern reaches, while in the south cattle grazed on the rolling hills of vast estates like the Irvine Ranch and Rancho Mission Viejo. Elsewhere, farmers cultivated celery, walnuts, lima beans, and sugar beets. Berries were common, too; the Knott's Berry Farm amusement park began as a roadside fruit stand on an actual berry farm. In 1950, Orange County was a network of modest towns surrounded by fields and rangeland, home to roughly 216,000 people. Highways and interurban rail lines connected the area to the growing metropolis to the northwest, but Orange County still played the role of country to Los Angeles' city. Then L.A.'s suburban growth began spilling over the county line, and new master-planned communities in the Garden City tradition sprang from once-agricultural lands. By 1990, Orange County's population had exploded to 2.4 million, and the area had developed into a semiautonomous, "postsuburban" region—a social transformation mirrored in the physical landscape. Much of Los Angeles County witnessed similar change, but in Orange County — as in the Inland Empire — the metamorphosis was recent and sudden enough that longtime residents still remember when office parks were strawberry fields, housing tracts were open pastures, and twelve-lane superhighways were quiet country roads. Memories fade, but the photographic collections of the Orange County Archives—a rich trove of more than a million historical images—more permanently preserve visions of Orange County's rural past. The Archives have made the highlights freely available through Flickr and have digitized tens of thousands more. 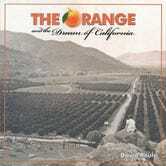 1 In fact, Orange County's name was first proposed long before oranges became the area's dominant crop. 2 Two new books tell the story of Southern California's oranges in detail: Jared Farmer's "Trees in Paradise: A California History" and David Boulé's "The Orange and the Dream of California." All images courtesy of the Orange County Archives. Southland is made possible by a partnership among Gizmodo, the USC Libraries, and the member collections of L.A. as Subject. Written by Nathan Masters, the series explores the urban past of Los Angeles, including the lost landscapes and forgotten infrastructures that continue to influence the city we know today. A version of this post previously appeared on KCET.org.